Degenerate art (German: entartete Kunst) was the term used by the Nazi regime in Germany to describe nearly all modern art. The Nazis banned the art because they said it was un-German or was Jewish or Bolshevist in nature. Artists who were labeled as degenerate were punished by the laws. They were not allowed to teach, they could not show or sell their art, and some were even forbidden from creating any art at all. 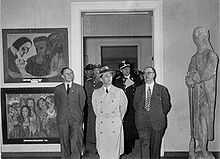 Degenerate Art was also used as the name for an exhibition put on by the Nazis in Munich in 1937. The exhibition was made up of modern artworks, displayed badly, with text labels making fun of the art. This was meant to make people hate modernism. The show traveled to several other cities in Germany and Austria. While modern styles of art were not allowed, the Nazis liked paintings and sculptures that were very traditional and old fashioned. They thought art should glorify Nazi ideas of the "blood and soil" values of racial purity, militarism, and obedience. Music was also expected to be tonal and free of any jazz influences; movies and plays were censored. The censorship was done by the Ministry of Public Enlightenment and Propaganda. This page was last changed on 10 May 2018, at 12:15.